Depression can develop in anybody and at any time, but people with a long term health condition such as diabetes are thought to be particularly at risk. So what is the link between diabetes and depression? Diabetes occurs when the process by which the body uses food for growth and functioning becomes impaired. When we eat, the food is broken down into a form of sugar known as glucose. This is then used as energy by the body. A hormone known as insulin produced in the pancreas helps to convert glucose to energy. Sometimes the production of insulin is impaired and diabetes develops as a result. When this occurs, the body is unable to fuel itself and the unused glucose will build up in the blood, causing severe health risks. With type 1 diabetes, the insulin producing cells in the pancreas are destroyed so that the body is unable to produce insulin. Daily insulin injections are required to enable the body to concert glucose into fuel. In people with type 2 diabetes, the pancreas loses the ability to produce insulin normally. Type 2 diabetes can often be controlled by diet and careful monitoring. Depression is a condition which causes feelings of sadness, low self worth and hopelessness which have an impact on the individual’s ability to carry out their daily living activities and relationships. It can develop at any time, sometimes as a response to traumatic events but often for no apparent reason. In more extreme cases, it can lead to self harm, self neglect or even suicide. How Does Depression Affect Diabetes? It is thought that the strain of managing a long term health condition can lead to depression. Diabetes can appear to be a very restrictive condition that requires careful monitoring; this can appear overwhelming when first diagnosed. The individual will be fully aware that this is a condition that they will need to deal with for the rest of their life. Some people with depression lose motivation to care for themselves. They may lose interest in maintaining the healthy diet needed for management of their diabetes or may neglect to monitor blood sugars adequately. They may turn to unhealthy lifestyle choices such as smoking or drinking alcohol excessively in an attempt to block out feelings of depression. This could have an impact on the symptoms of diabetes. Poor control can also reduce the effectiveness of certain antidepressant medication, which will make feelings of depression worse. People with diabetes and depression may be at an increased risk of experiencing diabetic burnout, which occurs when an individual becomes so frustrated by the constant monitoring of their condition that they cease to do this and knowingly eat foods and indulge in behaviors they know will make their condition worse. This could have longer term health implications, which will only exacerbate any feelings of depression. 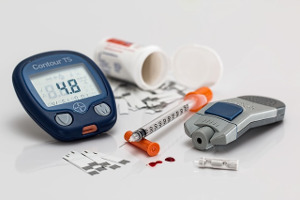 If you have diabetes and can identify with any of these problems, you should seek help to stop them from developing into a more serious problem.